As some of you know, I bought the yellow speedster that was on ebay a few months ago. I am now in the planning stages of how to go about rebuilding this puppy. I already have one of Mark Chaffin's Rajo kits (a very nice kit), but OF COURSE having a happy marriage between this car and the kit will probably require some creativity. Since one picture is worth a thousand words, I will post several pictures thereby saving several thousand words...! 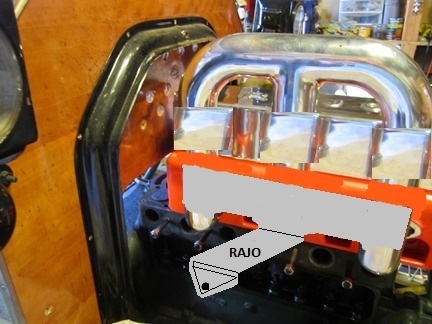 As you can see the Rajo will hit not only the firewall but also the coil box once a notch is cut for the Rajo. ANY SUGGESTIONS APPRECIATED HERE!...BTW - I will be running a distributor, BUT I would like to keep the coil box just because it looks cool and can be used as the ignition switch for the coil. As you can see, the intake manifold (as supplied with the kit) is going to stick WAY above the hood. It looks cool, kinda like Ed Winfield reincarnated, but it does not get along with the hood very well. Even when the head gets moved rearward by 2.75 inches the manifold still hits the alternator. Any thoughts or ideas from some of you speedster guys out there would be greatly appreciated!! 1. cut the intake manifold and lower it down. Probably just need to cut the two outer vertical runners. 2. Go with a belt drive alternator on the left side of the engine. A kit is available that is intended for pre '19 engines, but should fit right on what you have. Remember that down draft carbs are not permitted on at least one of the speedster runs. Thank you, Les! Those are both good ideas. If I cut the outer tubes, can aluminum be welded back together? Jon, Yes you can get the Alum welded and polished and you wouldn't be able to tell it was done. Since it's new material the job is easy. Cutting a hole in the hood with the intake sticking through it would look pretty cool. 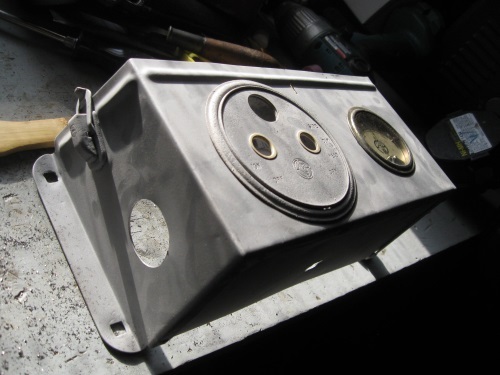 Make a new dash/firewall without the holes for the coil box and build a cover for the back end of the head/rocker cover incorporating the coil box. Looks like you will still need to notch the floor boards too unless they fit now. I looked at your speedster again and you could also consider just moving the firewall you have straight back a bit. Ultimately, nothing you do is going to just be super easy unbolt/move/rebolt. Just decide what works for you. If you go the route of the false coil box you'll probably want to insulate it and you'll have to make sure you build something underneath so you can keep the heat off you and your passenger from the head/engine being right there. Intake: what carb are you going to run? I would talk to Mark as I'm sure he made the intake the way he did for a reason. You could shorten the runners on the outside and also shorten the center section. I don't know for sure but I bet if you basically remove the entire straight length of the runners so that you're only connecting the end of the bends, you'll be able to shorten the center section enough to make the carb clear the alternator. You could also possibly incorporate something into the intake center tube like this S adapter http://www.snydersantiqueauto.com/1716 so that it moves the carb backwards and keeps it plenty low so you don't need a fuel pump. Just some thoughts, YMMV. You might not need as much clearance as you think with the carb since the whole head has to go backwards a few inches before it's in the right spot anyway. This is VERY helpful. Thanks, guys! I was sort of thinking about cutting the manifold down, so that solves part of the problem. I was also thinking about a new firewall, and maybe I can work that out with Ray Syverson (above - who makes firewalls)) so then this all works. My thought was to move the coil box up about 3-4 inches, and just use a couple of the electrical posts. You would eliminate most of the holes (all but two) - input from the battery and output to the distributor coil going through the ignition switch. Hey Jon I don't know what all you have planned for your speedster but since it is brass like mine and you seem to have deep enough pockets: I'm going to get one of Mark's kits eventually and when I do I'm going to get the Rajo valve cover, intake, and the port cover all brass plated so that it matches the rest of the car. Gotta make sure she looks just as good under the hood as outside the hood. Also, I have a low hood where someone cut, and then badly repaired, a hole for a carb setup. So a larger hole would need to be cut. I cannot tell from your photos if it would suit you, but would let it go cheaply for a good use. It would have no use to anyone in a stock setup and would save the guilt of cutting a good one (like one might have when drilling giant holes in a coil box). PM me. I don't mind a little chrome or polished aluminum mixed with the brass. But you're right, it would be really cool to have all of it brass! BTW - that adapter at Snyder's is turned the wrong way to go with Mark's manifold. Another possibility is a side draft, but easier would be to just shorten the center tube of the manifold as well as the side tubes. Then several of Stan Howe's brass updraft Strombergs would work. If you're going to maybe shorten the runners on the intake anyway don't let something like the orientation of the flange change what you want to do. Just cut it off, turn it 90* and weld it back. Or just cut it off and weld the piece in directly and then turn the flange on the other end to work with whatever carb you want. I don't know if that piece in particular will help you, just trying to help you think outside the box a bit more. It doesn't have to be bolted together. In fact, as I think about it, you could cut up that manifold and use only it to make it what you want/need. Here's a VERY crude pic but should convey the idea of what I'm thinking you could do. You just cut the runners and the center pipe, weld up runners so whole thing fits under hood, then cut the center piece on an angle so you move the carb down and back. Just an idea. 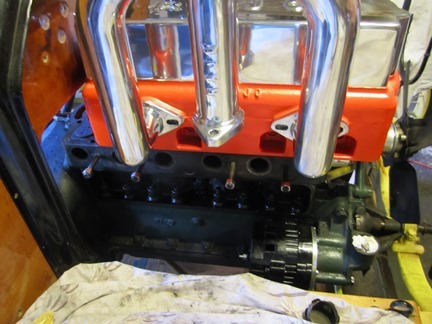 Well, sorting through what has been said, I think the simplest option would be to cut the two side pipes on the manifold so that the carburetor is at the correct level to line-up with the throttle. That will drop the manifold enough so that it won't hit the hood. One of Stan Howe's Stromberg OX-2's would probably be my choice. 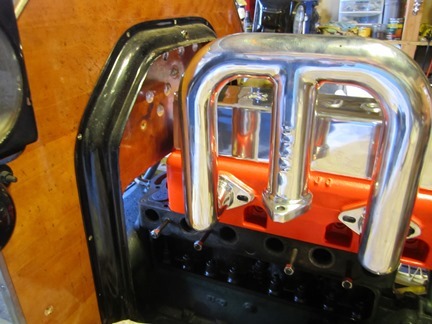 It mounts the right way so that it will line-up with Mark Chaffin's manifold. As for the coils, what about a Bosch or some other mag? The manifold is a copy of Ed Winfield's manifold which was designed to employ the Helmholtz Effect. Changing the height of the runners could negatively affect the Helmholtz Effect. This may or may not affect engine performance. You may want to consider this before doing any cutting. I have talked to Stan about this, and he thinks an OX-2 would work just fine. I already have an OS-1 from him on my '14 runabout. One thing I have learned from putting these Strombergs on a T - you MUST use a fuel pump! The weak pressure feed by gravity flow is not enough to keep the float bowl filled. This was true for BOTH an OF and an OS-1 on my runabout. It would just quit right in the middle of the road (even on flat ground) until I put a fuel pump on. After the float bowl filled up again it would go for another little bit and stop again. As you can see I used a "Mr. Gasket" 4psi fuel pump from Pep Boys preceded by a filter and followed by a pressure regulating valve and a gauge. I have found that it works well with the regulator valve (0-4psi in steps of 1/2psi) set for about 2.5 psi. The pressure from gravity flow in an early T is about 0.5 to 1psi, apparently not enough for these thirsty carburetors. Jon - Agreed. I had an RF installed that I tried to test using gravity feed, and couldn't keep it running. It would run for about 20 seconds and quit. I installed a Carter 6V pump, in-line filter, and a Holley regulator running at about 1.5 lbs pressure. Runs like a champ now. I imagine I'll need to increase the pressure when I get my OS-1 installed (need to fabricate an intake that will fit my Rajo Model 30 OHV first). Apologies for the thread drift. If your speedster has a stock length hood you could buy a Torpedo Roadster hood which is a couple inches longer. That moves the firewall back and gives you a bunch more room back there. Would require some mods to the body to make it happen. Erik beat me to the hood length question. I have one of Mark's heads on my Mercury. One thing to note is it takes a lot of vertical clearance to remove the valve cover, I'll measure mine and let you know how much. The valve cover pretty much has to go straight up until it clears the rockers and felt. I would make a new intake manifold. I have a Winfield manifold for a model A on mine, I had to elongate the manifold slots but it worked on this head and my 4 valve. What you are saying, particularly about removing the valve cover, is making me think seriously about moving the firewall back. To remove the valve cover in the present position would require a very large cut in the firewall and is something I had not thought about. What else is involved in moving the firewall back besides a longer hood? What about the steering? 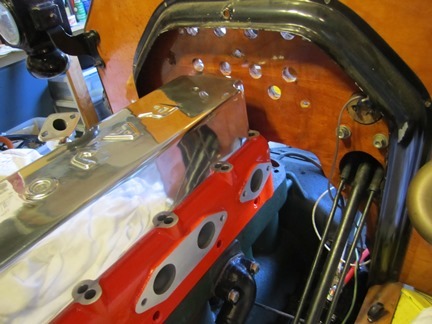 Steve Lang has suggested leaving the firewall where it is and putting spacers behind the coil box to move it back. You don't need much extra cut to get the cover off a Fronty; you can sort of roll it off. I'll try to take pix. Yea, I was thinking along those lines. You might have to make the cut in the firewall just a bit wider to allow you to roll the valve cover. I am going to make a temporary firewall out of cheap plywood myself and try some of this stuff. Once the temporary firewall is working properly, I can send it to Ray Syverson and have him use it as a template to make a better one. Jon - How's about I just send you a new aluminum hi-comp. head in exchange, you can just box up that "headache" project and send it to me - even Steven ??? That was an attempt at humor, Jon - check out my profile photo - Racer hand built by yours truly ! 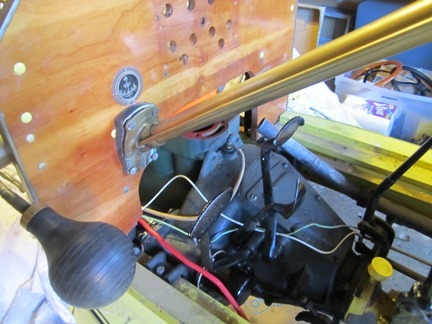 BB RAJO and being a bit challenged in height, I moved the firewall back & shortened my steering column. I own & operate a Model T Repair & Service shop. Looks from the pics it wouldn't be hard to move the firewall back on you car. The steering column would have to move back too. Not sure how this may complicate things with stock T steering. All of the cars I have built this way I cut off the steering shaft just forward of the firewall and ran a u jointed shaft down to a conventional steering box on the frame, usually a Corvair box. I can say that the Torpedo hood gives you a lot more breathing room under the hood and the extra length gives the car a more racy appearance. I hear ya, Seth - sometimes there can be a "tough" crowd rolling through here ! That bit of philosophical advice about not working on old cars if you don't like these problems is to remind MYSELF of that every time I get to bitching about some problem. It helps me to smooth out the rough spots. It was one of those moments when I set that RAJO stuff on top of the engine and said: "OH SH*T, this is going to be job"...! Talking with you guys makes it all better. The cool thing about a project like yours is that the result will be like no other, truly individual and a testament to your creativity. Rock on! I might have enough cherry 19mm Baltic ply left to give you for a new firewall if you're ever down this way. Tom is correct. Do not change the length of the intake tubes or else you will lose the effect of i's self supercharging Helmholtz effect. If you live near a Rockler or Woodcrafter store you can get a nice piece of plywood or solid to replace that firewall with. I used a solid piece of 2 x 4 red oak and get compliments on it all the time. If I was building that set up, I would take an aluminum repro hood, and polish it to match the polished manifold. Then I would carefully cut an elongated oval hole perfectly to match the manifold so it can poke up through the hood. It would look good if done well. See my napkin scribble. Tell me a little bit about the "Helmholtz Effect". Is that something about pressure in the intake manifold? It seems like some guys make the most arbitrary looking manifolds and get away with it just fine. How much do you gain or loose due to that effect. Is it worth worrying about? I like your design. That would be kinda cool. It looks to me like there is not much metal left around the cut out in the hood. Would it need to be reinforced? Mmm. Personally, I'd have to see a T with Mark's head dynoed with everything exactly the same except switch that huge manifold out for something that fits under the stock hood. It'd have to be a pretty significant (able to actually feel a difference in acceleration or have a 10+ mph top speed improvement) for me to cut up the hood and make that manifold work. Also, it might be ok for some of you guys mixing chrome (or polished aluminum) but not this kid. It's either one or the other for me. John, the hood can be cut without having to reinforce it, because an aluminum hood is very light and will hold its shape. 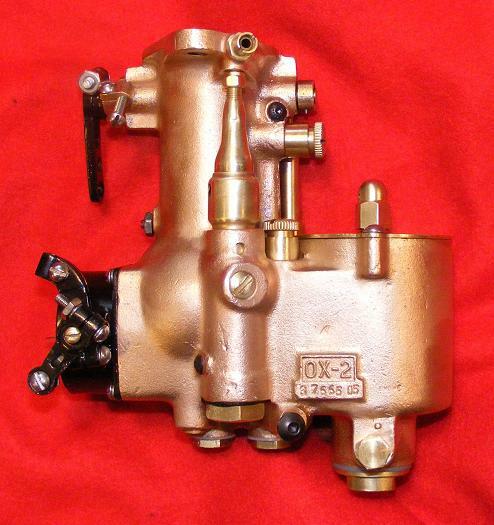 I have seen hoods with openings for downdraft winfield carburetors on early T sprint cars. You can also have a spare hood panel made if you want to change it back to stock. I mentioned a repro hood so you wouldn't have to cut a good original. Jim Cullinane and Humble Howard talk about the "Helmholtz Effect" in one of their Model T Speedster books. I believe they were talking about a 17" length for a T, but it's been awhile since I've read the article and now I can't find it. Yes, the manifold was designed after the successful (and proven) Winfield 2 up and 2 down in mind while also incorporating the theory of the Helmholtz tuning method. The late Jim Cullinane was instrumental in creating the final design. A few are in use and I have heard nothing but rave reviews. 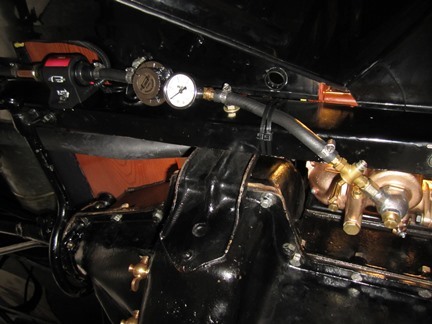 In light of Jon's issues, we will be considering reproducing a Model A Winfield style manifold for those installing the kit in an early style car. Once available, the buyer can identify which manifold they would like to have supplied when purchasing the kit. Of course it all cost money to design, have patterns made and create tooling fixtures. Still waiting to recoup the initial out of pocket costs associated with producing the RAJO kit. 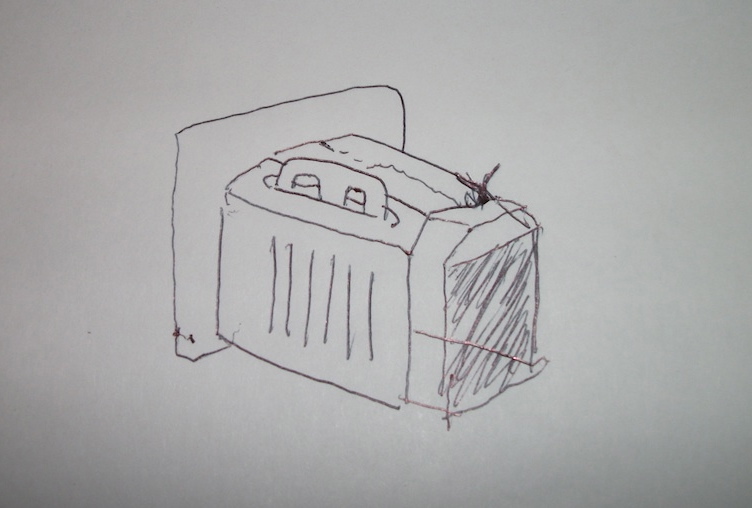 Ed did a good drawing, but it still looks like a toaster with one slice popped up. Aaron, if that's toast popping out of the hood, it must be made with hole wheat bread.